If you have ever been to the hangar on a bout night, you probably seen Amber (Waves of Pain) slinging merchandise for the league and watching the bout play out. She is as dedicated to RCR as she is to roller derby itself, and gives them both 100%. 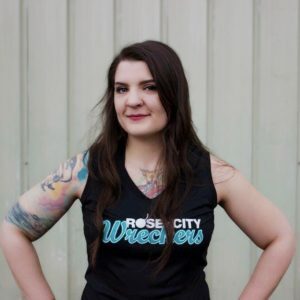 Rose City Rollers is more than proud to honor Amber for her time, effort, and energy poured into helping shape the community, as our Gold Star Volunteer recipient for October. Make sure to stop by the merch booth, grab a sweet t-shirt and tell her congratulations. Why have you stayed involved with RCR?  Beyond learning the skills needed to play roller derby, RCR has given me the opportunity to become part of a strong, supportive community of people—some who have become my dear friends. I joined the league during a transformative period in my life and as a result, grew stronger mentally and physically both on and off the track. What was your favorite volunteer experience? I love working at the league merchandise table because I get the opportunity to talk to roller derby fans from all over the world. Whether it’s their first or 30th time attending a bout, the fans possess an excitement that’s electricrifying. I get to share that moment with them and hear firsthand the love, support, excitement for the sport of roller derby, for our awesome league and our dedicated skaters. Simply put, it’s the opportunity to contribute to a community and sport I love as well as a chance to be a part of something bigger than myself.